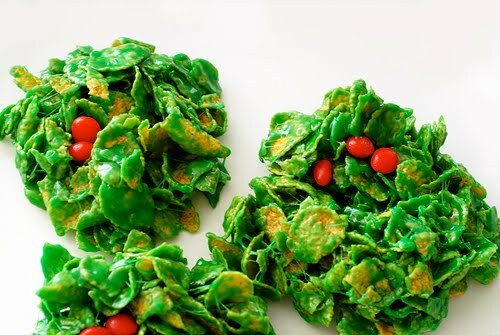 For Easter I thought it would be fun to make a special treat just for the kids…. I stalk, I mean follow another blog called The Girl Who Ate Everything, and saw her make these darling rainbow cupcakes. I thought they would be perfect for Easter. Of course I made another dessert for the parents, but I think we all wanted a piece of these! I was so careful filling the cupcakes so they were perfect and the recipe made just enough. I baked them and was letting them cool so I could frost them, when I heard a chair sliding across the kitchen floor. “Rush, put the chair back!” I yelled. Then I thought I heard the chair slide back to the table. In true Seinfeld fashion (see the muffin top episode) he had eaten the tops off 3 of my cupcakes! I only had just enough as it was! Oh Well, the boys got a different treat! This is what they looked like when they were done and displayed. This is from her site (not my photo below!) look at how cute they turn out! Combine all ingredients until incorporated (about 30 seconds). Scrape sides of bowl and then beat on med-high speed for 3 minutes. 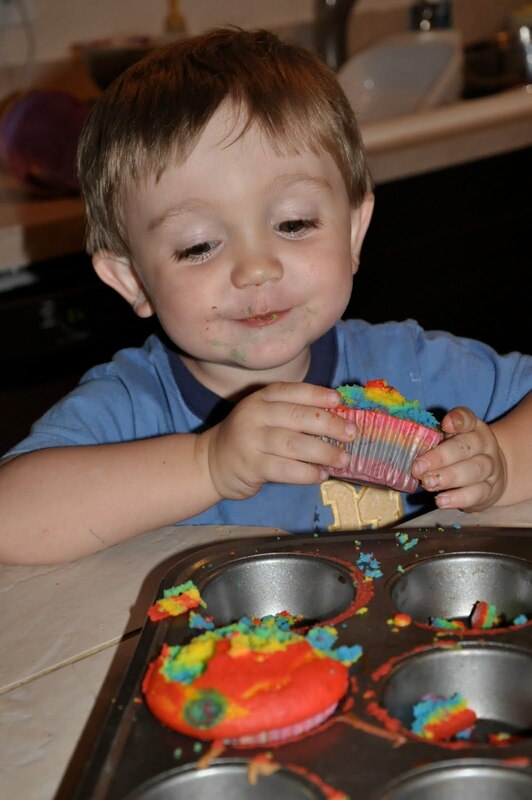 To get a layered stripe like I used, you’ll want to put a spoonful of each color in the cupcake one at a time. The batter is thick, so it won’t spread on it’s own. A great tip is to set out a little bowl of water where you’re working. Dip your finger in the water and then gently spread the batter out. The water will make it so the batter doesn’t stick to your fingers. Bake them according to the package directions, until a toothpick comes out dry. Frost with your favorite frosting. If you had to use store bought like me, fancy it up by putting the frosting in a ziplock bag. Cut of the corner of the side of the bag and you have an instant frosting decorating bag. I was addicted to Food Network trying to find recipes. One day I saw this one and we have been making it ever since! BTW, I made 23 of these for my brothers wedding (as part of a HUGE menu) and they were a HUGE hit! 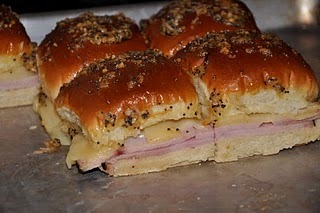 My husband made these the other day, we always make extra and wrap them tightly in saran wrap to keep in the fridge for a day or so. We take them to the ball park for dinner and cut off slices for everyone! When I went back to find the original recipe from Giada this is the recipe that they had. It is NOT the one I saw her make a few years ago, so I will try and tell you how to do it! 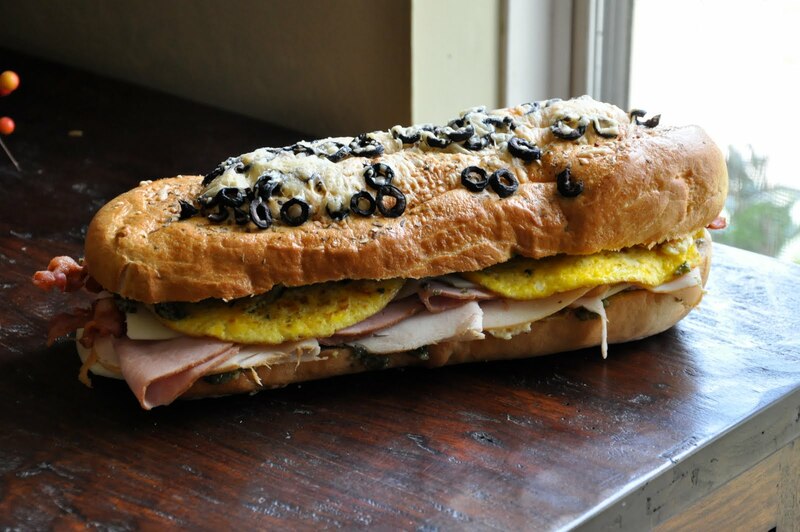 I buy the italian Muffuletta bread, it is usually round. My husband grabbed a loaf style for this one. 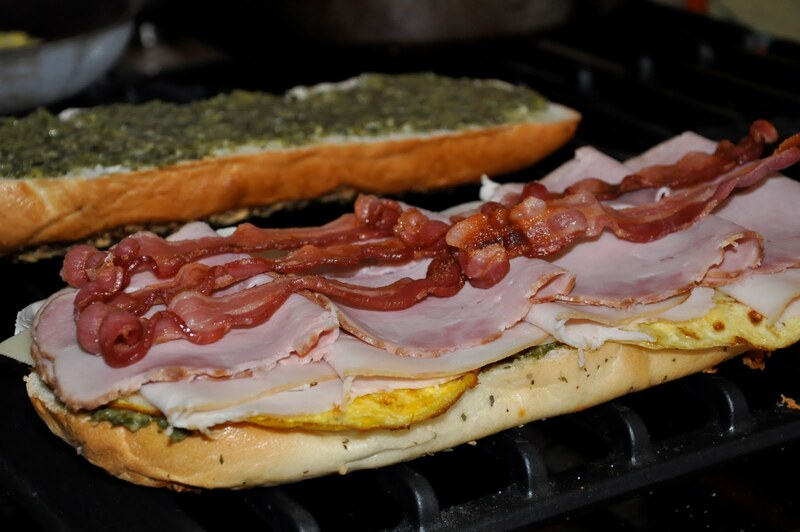 Slice it in half and toast both sides. Set aside. 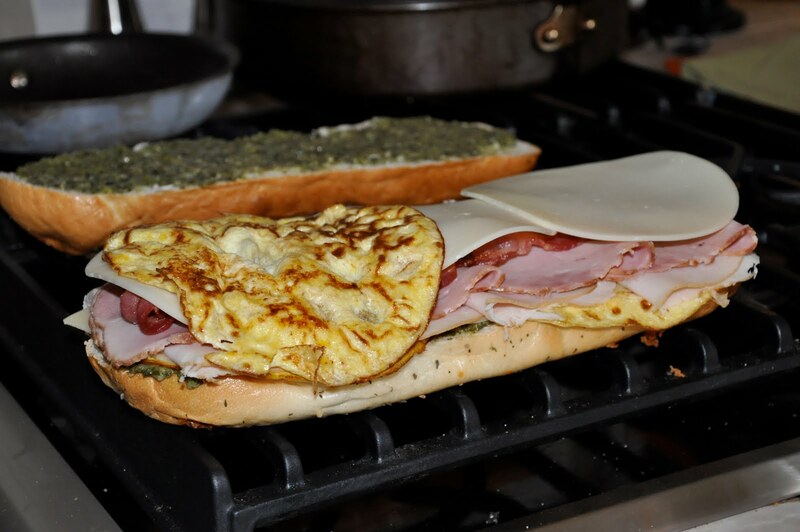 Make 2 egg crepes to fit the halves or 4 to fit a loaf. To make the crepe, beat an egg well add a little milk. 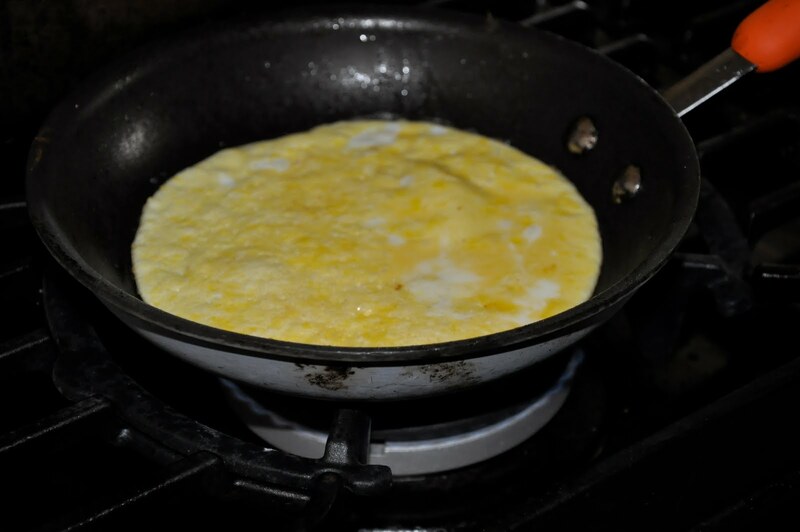 Get your pan hot and add butter, pour the egg mixture in and swirl around so it is thin. Cook on one side for about 2 min, sometimes you have to flip over sometimes it is already cook. Place on plate to cool. 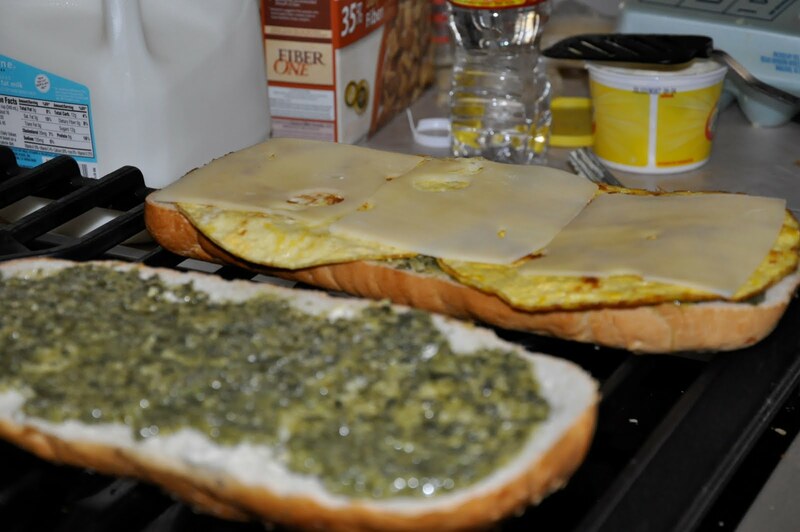 Next, spread pesto ( I buy bertolli’s pre-made, it is my favorite kind!) don’t skip this part! It makes the sandwich, my little kids even love it! Then layer with an egg crepe. Next add cheese, we use provolone and swiss. 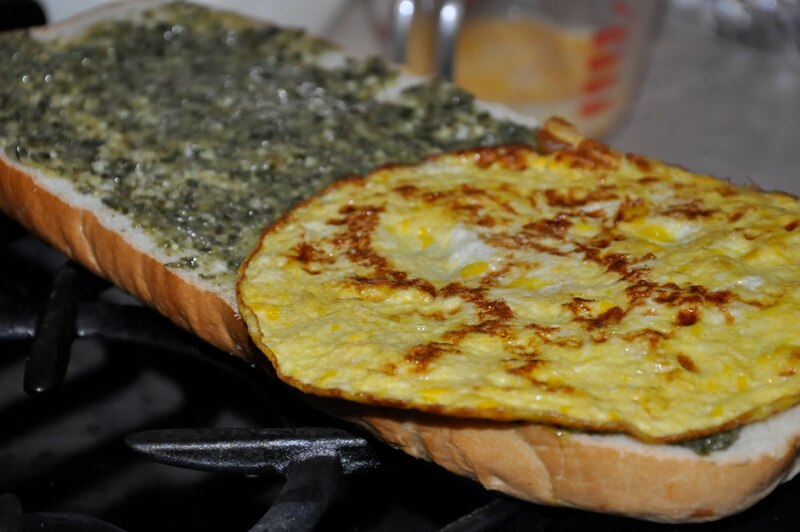 Top with more cheese and another layer of egg crepe. There it is! 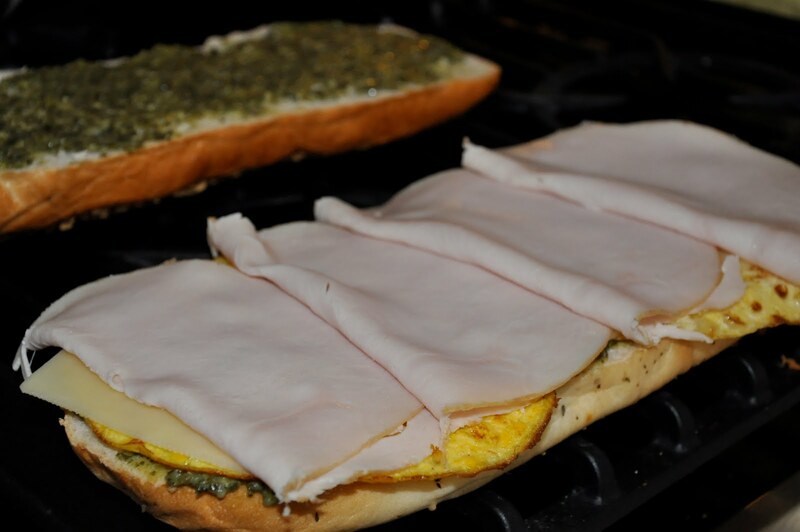 One of the best sandwiches you will ever make! Like I said, we make a few and wrap them tightly to eat for a few days! Every Holiday I find an excuse to make sugar cookies. 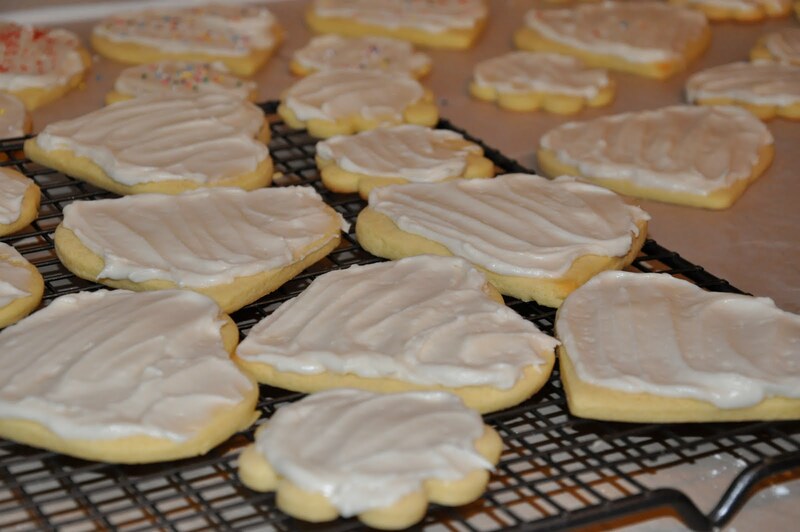 For some reason, homemade sugar cookies with homemade frosting are one of my favorite desserts! Look how yellow this dough is! A friend and I traded services, I did her hair and she gave me fresh eggs from her chickens. I got the better deal! I forgot how wonderful and colorful fresh eggs are! The yolk is so yellow and they taste much better! Anyway, it made me giggle that the dough took on the same color! I like trying good sugar cookie recipes esp. from friends who have had the recipe for a long time. My favorite recipe is my friend’s Michelle K. recipe, which I have lost, and need to get from her again so I tried a new one. Do you have a recipe you use?? What are you having to eat tomorrow?? Brownies HERE. 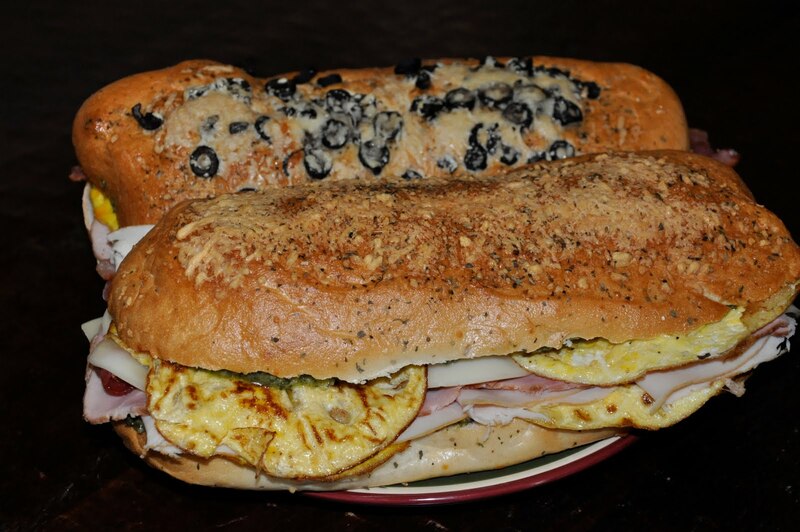 I plan on making a few different kind with different fillings. 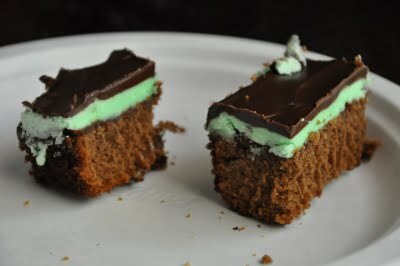 I am one of the only ones who like the mint, so I will do peanut butter and a chocolate mousse also. 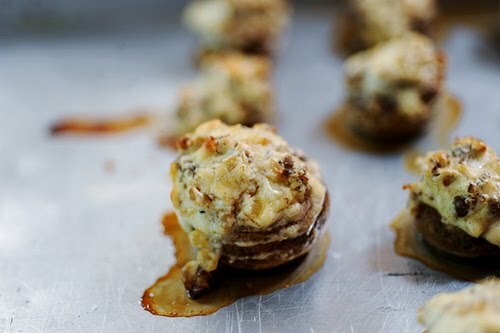 Can’t have a party without Pioneer Woman’s Stuffed Mushrooms recipe HERE I am not even a mushroom person and I like these. Ask my husband, I pick them out of everything but I love these. Go figure. My husbands and brother-in-law Jeff’s request…. Velveeta and Sausage dip, recipe HERE. I am sure we will be adding a few more things. What will you be having?? 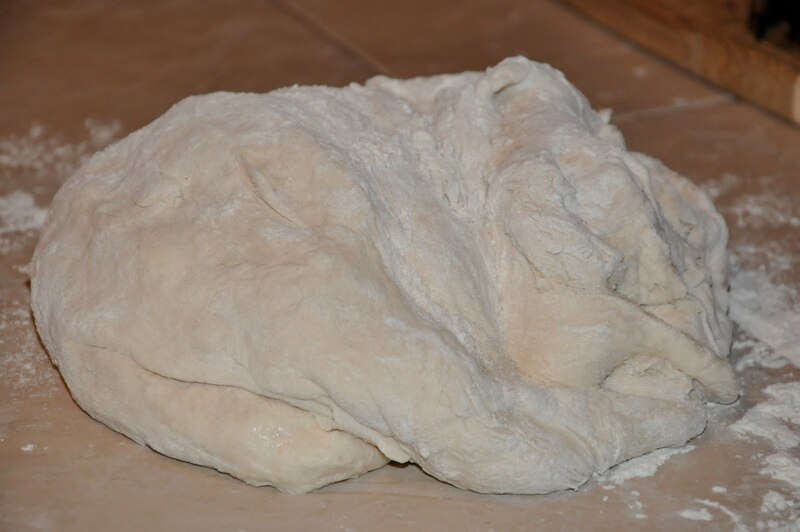 This is my very favorite pizza dough recipe. Mostly because I don’t have to plan ahead, you do not let the dough rise for this recipe! 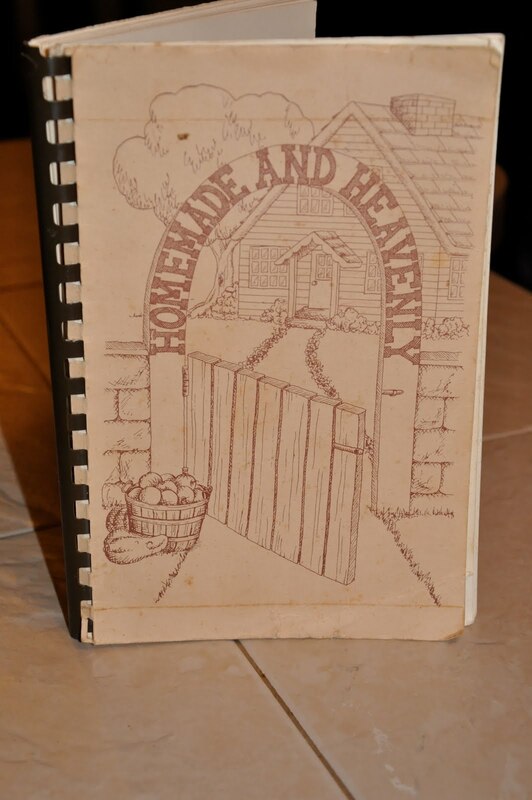 A very long time ago when I was little my Mom and some ladies at church put together a cookbook. I remember them working on it in our living room, this was back before computers and word processors, they typed the entire thing on typewriters and bound it themselves. These are my very favorite kind of recipe books! This recipe is from that cookbook. Mix the other ingredients together. I add a little honey and garlic salt. When it pulls away form the bowl take it out and kneed by hand. You don’t have to kneed very long, just until smooth. 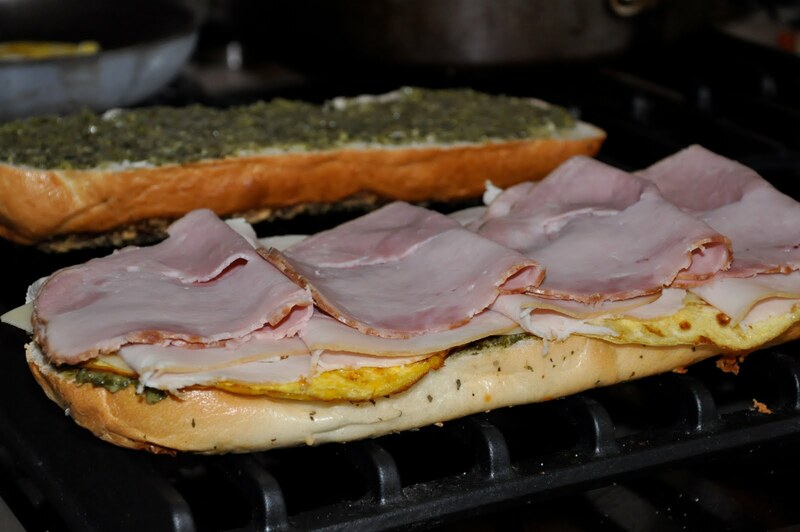 If you doubled the recipe, divide it in half. 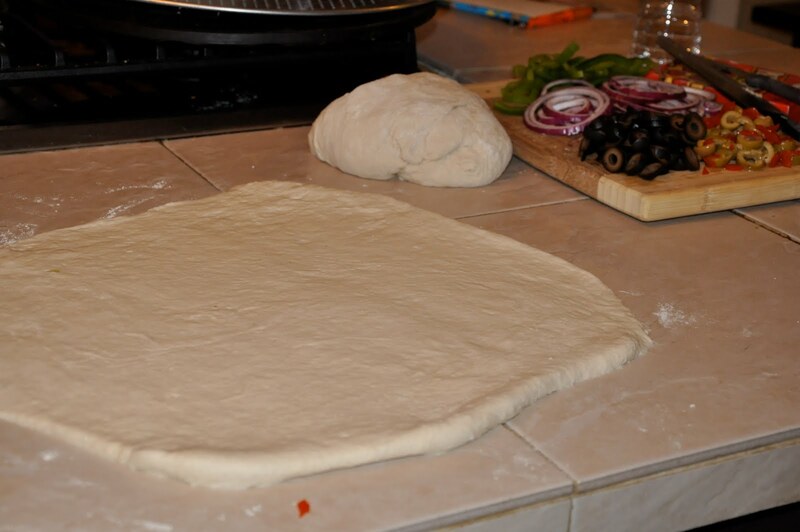 Flour your surface and roll out. Place on pan, and finish patting out. Poke holes with a fork so it doesn’t rise. Bake at 500 degrees for about 5-7 min. until slightly brown. Take it out and then put your toppings on. I recruit children at this point! 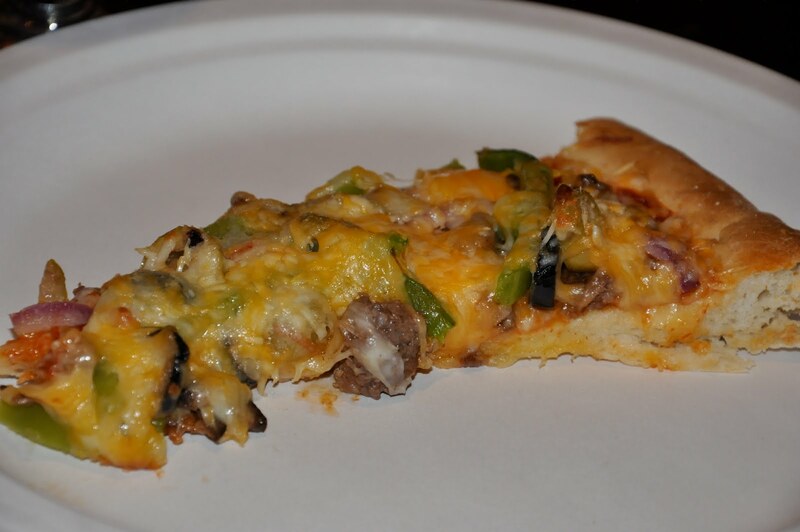 This is for the “adult” pizza. Put back in the oven at 425 for another 15min or until golden brown. 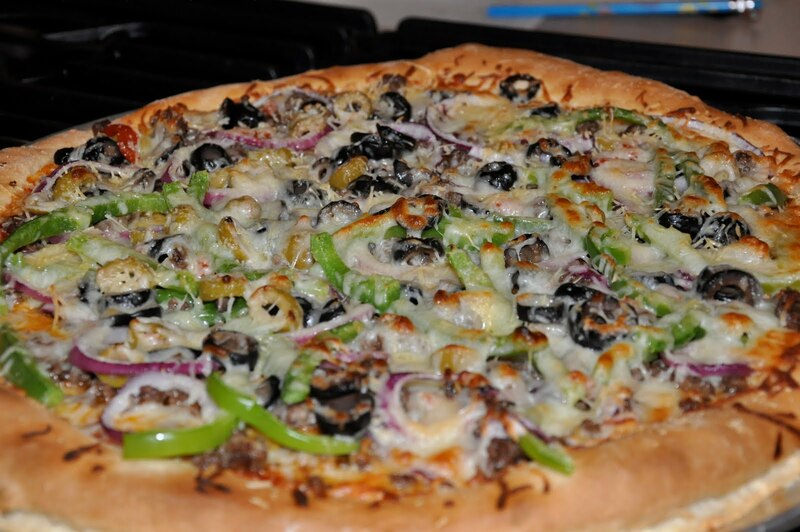 On this one we did hamburger, 2 kinds of olives, red onion, green pepper and 3 kinds of cheese. It was awesome! 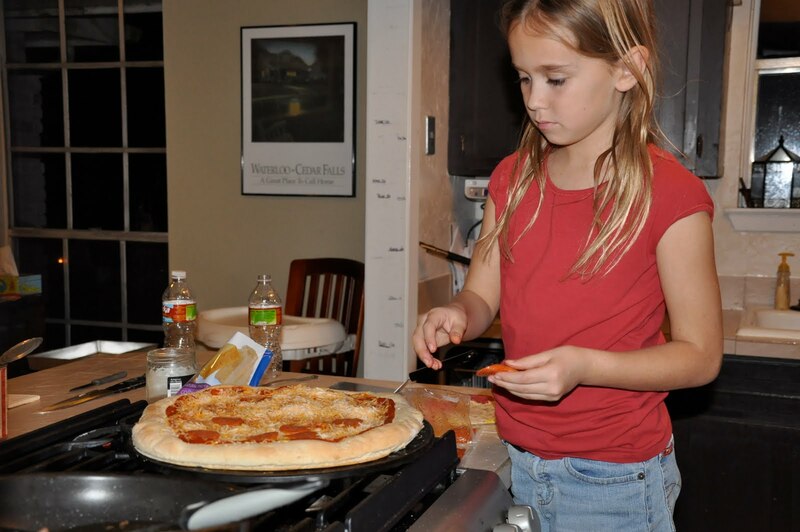 The kids had pepperoni and cheese. For one pizza. Double for two. 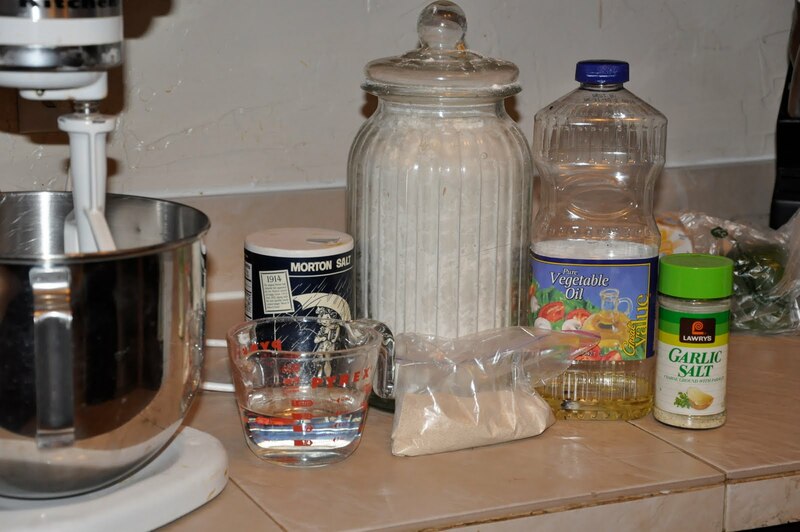 Dissolve yeast in warm water. Add salt, oil 2 c. of flour and beat until well blended and smooth. 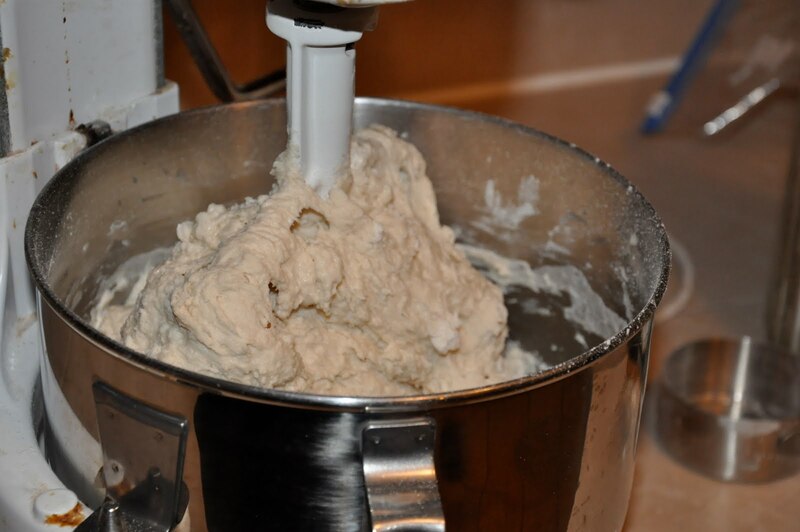 Add remaining flour to make a stiff dough. Knead until smooth and satiny. Do not allow to rise. 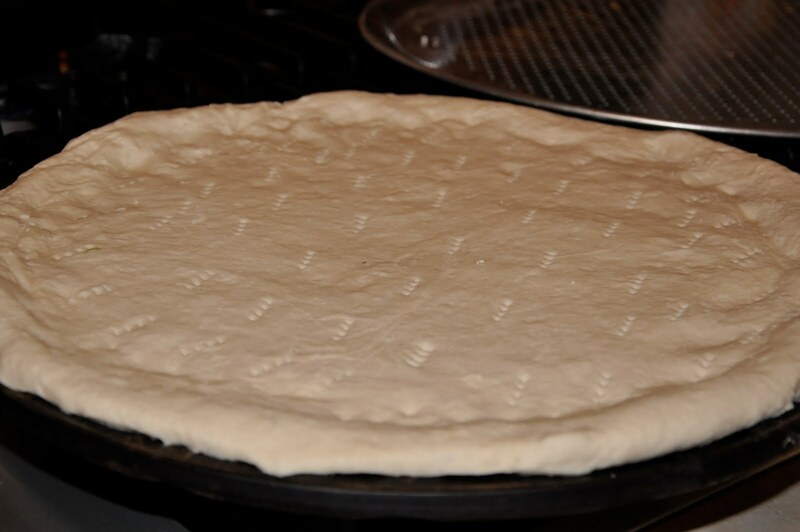 Roll out very thin for crispy crust and pat out thicker for chewier crust. Place in 500 degree oven, on bottom rack and bake about 5min. 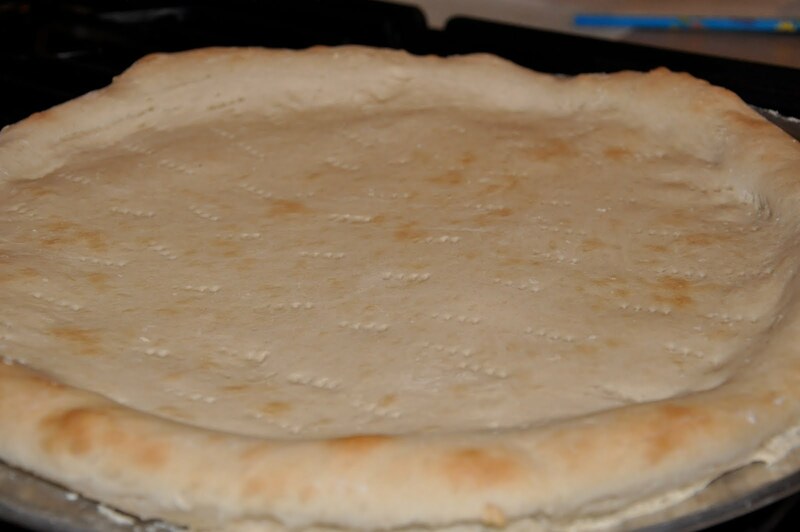 or until there are brown spots on the underside of the crust. Top will bubble and start to brown. 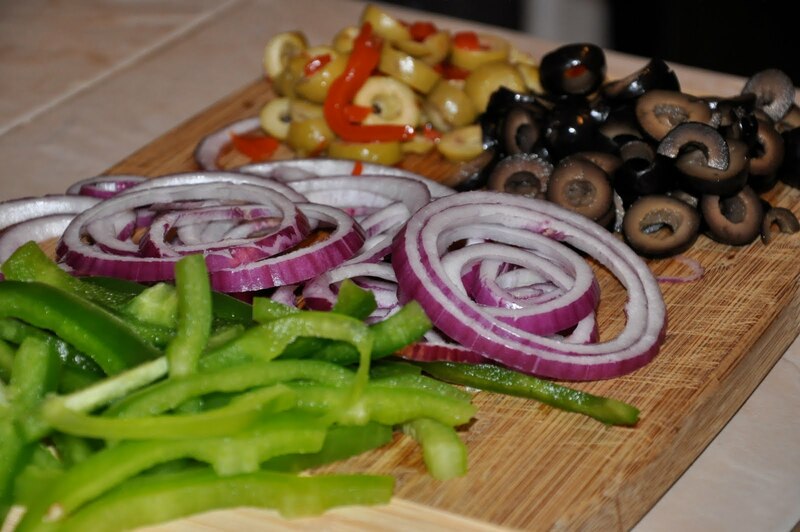 Remove from oven and top with sauce and toppings. Lower oven to 425 and bake for another 15min. What to do with all those boxes of Corn Flakes! Recipes! Did you get your Corn Flakes for $.25 a box? See post below on how to get them! I actually already grabbed mine this morning. What am I going to do with 12 boxes of Corn Flakes? 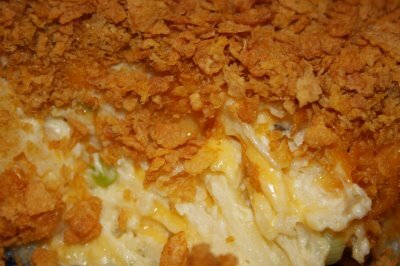 These are a few of my favorite things to make with Corn Flakes! P.S. My very favorite is the Funeral Potato recipe at the bottom! Gotta love ’em! Melt margarine in large saucepan over low heat. Add marshmallows and cook, stirring constantly, until marshmallows melt and mixture is syrupy. Remove from heat. Stir in food coloring. Add corn flakes. Stir until well coated. Portion warm cereal mixture using 1/4 cup measure. 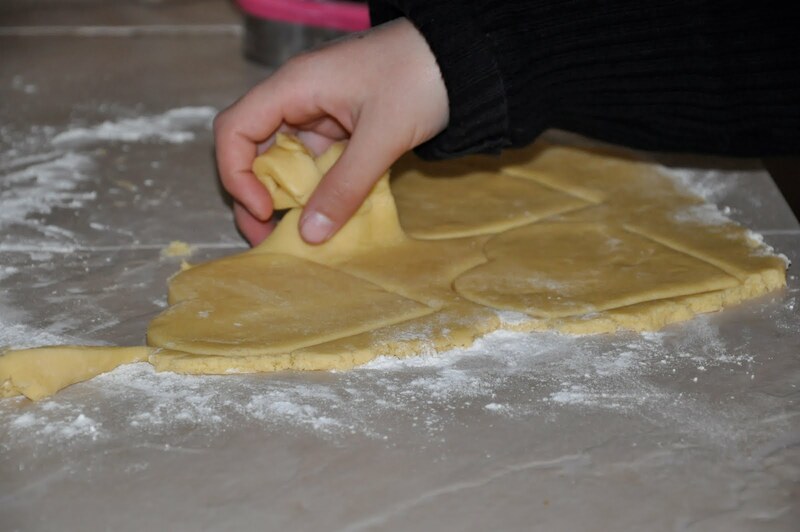 Using buttered fingers, quickly shape into individual wreaths. Dot with red cinnamon candies. In a large bowl, mix together the canola oil, margarine, brown sugar and white sugar until smooth. Beat in the eggs one at a time, then stir in the vanilla. Combine the flour, baking soda, baking powder and salt; stir into the sugar mixture. 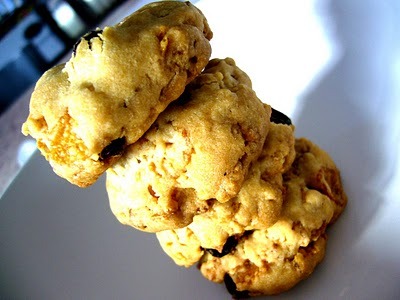 Mix in the cornflakes cereal, oats, chocolate chips and walnuts. Drop by heaping teaspoonfuls onto the prepared cookie sheets. Bake for 12 to 15 minutes in the preheated oven, until golden brown. Allow cookies to cool slightly on the cookie sheets before removing to wire racks to cool completely. 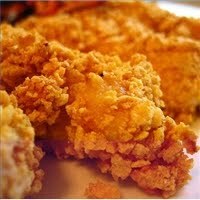 Coated with a homemade “shake and bake” mix made from cornflakes and seasonings, this oven-baked chicken tastes as good as fried chicken (without the fat). Our kid testers liked crushing the cornflakes and shaking the chicken pieces to coat them with topping. Heat the oven to 375º. To make the coating, pour the cornflakes into a sealable gallon-size plastic bag and use a rolling pin (or your palms) to crush the cereal. Open the bag and add the flour, paprika, onion powder, and sage. Shake salt and pepper (about 1/8 to 1/4 teaspoon of each, depending on your family’s taste) into the bag, reseal, and shake until well combined. Bake for 50 minutes or until done. (Meanwhile, prepare the potatoes, carrots, and biscuits.) Be sure to check the chicken for doneness (see our tip, above). Serves 4 to 6. 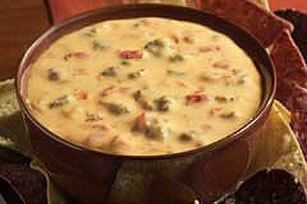 In large bowl combine soups, sour cream, cheese, onions, and the 1/2 cup of melted butter. Gently fold hash browns into mixture. Combine crushed corn flakes and the 2 Tbs. of melted butter and sprinkle on top of potato mixture. *If wanting to, you can use cubed potatoes instead of hash browns but you will need to increase baking time to 55 minutes.